Addictive Drums 2 review for finger drummers! Addictive Drums has been my bread & butter tool for finger drumming since I started developing the XpressPads finger drumming eCourses back in 2010. Since that time I have produced many tracks with this outstanding virtual drum module. There are many reasons why I like Addictive Drums 2, and I am excited to share them with you today. 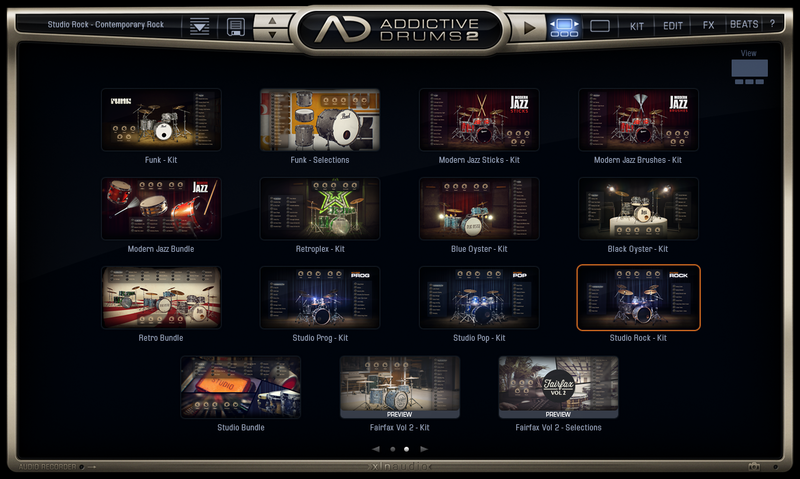 Addictive Drums 2 gets my top rating for most of these attributes, and I’ll go into details for each one below. What you won’t find in this article is a review of the midi grooves that Addictive Drums 2 comes with and the options for changing those to your liking. That would require too much delving into the area of drum programming. As a finger drummer, though, you will seldom need them. As a finger drummer using the XpressPads technique you’re able to play grooves off the top of your head, so there is no need to work with midi grooves. Most of the value of any virtual drum module is defined by the sound of the drum kits included. So, how does Addictive Drums 2 sound? Awesome! While putting it all into one word clearly does not reflect the amount of work put into the system by XLN Audio (the company that developed and distributes Addictive Drums 2), “awesome” is my perception put into one simple statement. But, let’s get a bit more specific. Which aspects of “sound” are really important for a virtual drum module? I think that’s the authenticity of the sampled acoustic drum sounds overall, the “space” that one can perceive from the additional overhead and ambience mic channels, the number of velocity layers per sampled kit piece and how those have been programmed in the software, as well as – and this is very important – the transition between low- and high-velocity hits played on any kit piece of a virtual drum kit. Eventually, when in addition there are many options provided to change and tweak sounds within the software, then awesome sound quality is achieved from my point of view. Addictive Drums 2 gets 10 out of 10 points from me for all these aspects. Two more important factors that define the value of a virtual drum module are its ease of use and its workflow. In both areas, Addictive Drums 2 meets all my needs. The interface and all its main menus are almost self-explanatory. No matter which virtual drum kit is loaded, the required controls always appear at the right place and in the right workflow moment. So, once one becomes acquainted with the available options, there is no time lost on searching for options to make the adjustments you want. No matter if one wants to change kit pieces, kit piece attributes, mixer routings, effects chains or anything else, the workflow behind every activity that can occur when finger drumming and producing a drum track are extremely well organized and smartly thought through by XLN Audio developers. Another aspect that makes Addictive Drums 2 very easy to use is its standardization of MIDI mappings. No matter which virtual drum kit preset is loaded, the mapping is always identical. This is extremely helpful if one wants to play finger drumming with a standard pad layout on a pad controller, such as with the XpressPads finger drumming midi mappings. The importance of MIDI mapping standardization cannot be overestimated, as standards make you feel safe in your finger drumming “environment”. A tom pad on your pad controller should always trigger a tom sound in your virtual drum kit, and with Addictive Drums 2 this has been taken care of. In some occasions one might want to change the standard mapping and instead play some special drum sounds that a virtual drum kit preset offers. Not a problem with Addictive Drums 2! It comes with an option to midi-learn any drum kit piece and associated articulation. This gives one the freedom of assembling a custom drum kit on the fly. Exchanging kit pieces in a virtual drum module is an additional big value. If one owns several expansion packs (“ADpaks,” in the case of Addictive Drums), exchanging kit pieces opens up a universe of drum sound combinations and building the perfect drum kit for a track. 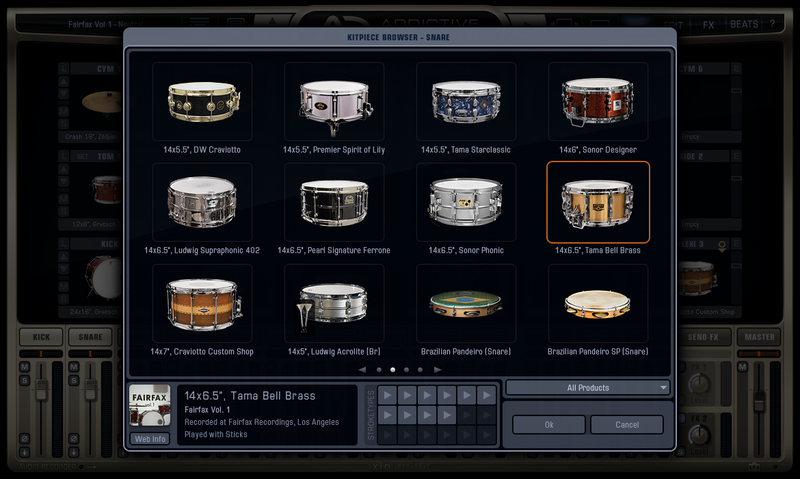 In Addictive Drums 2, single kit pieces and even groups of kit pieces – such as the whole tom section – can be exchanged. The more ADpaks a person owns, the more exchange options are available. I haven’t seen any HQ virtual drum module that loads presets as quickly as Addictive Drums 2. To me, this capability is a big performance plus. Why do I believe that this is so important? Because it dramatically speeds up the overall workflow. Imagine working on a song that has you busily trying out different virtual drum kits and presets. If you own a couple of expansions, there might be several hundred different presets at your disposal. It drives me crazy if I have to wait long for a preset to load. Such a slowdown of the pace has a negative impact on the creative flow that I am in when working on a song. With Addictive Drums 2, there is no such problem. When a new virtual drum kit is loaded from the main application or one of the ADpak expansions, it only takes a few seconds to load. If the drum kit itself isn’t changed by a loaded preset, the load time is even shorter. That’s awesome! 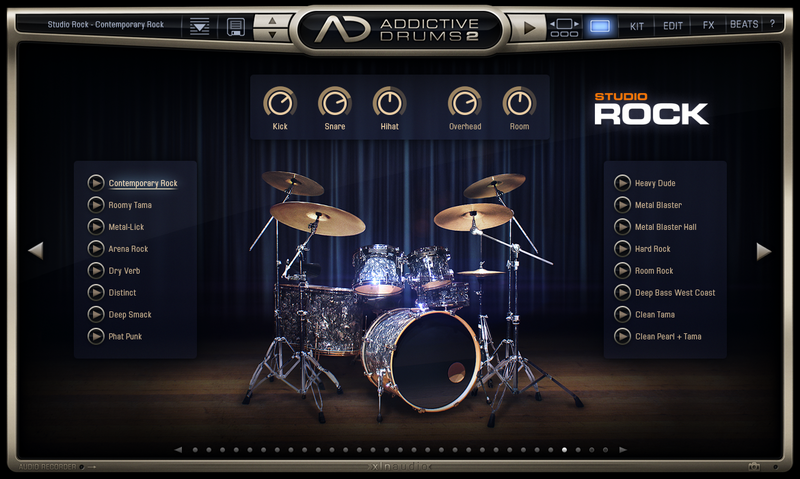 Like many other virtual drum modules, Addictive Drums 2 is expandable. XLN Audio offers ADpaks for any style of music with several style-matched drum kit presets. Currently there are almost twenty virtual drum kits available that cover styles like rock, pop, metal, jazz, latin, electro, funk, retro and independent music. All of these ADpaks come with their specific visuals. Since each kit piece of any ADpak can be used in another virtual drum kit within Addictive Drums 2, the ADpaks dramatically increase one’s arsenal of sounds. Also, the sound quality of each ADpak is top-notch. The ADpaks each range between 300 megabytes and 2 gigabytes in size; this makes them lightweights in terms of space-usage on a hard drive. 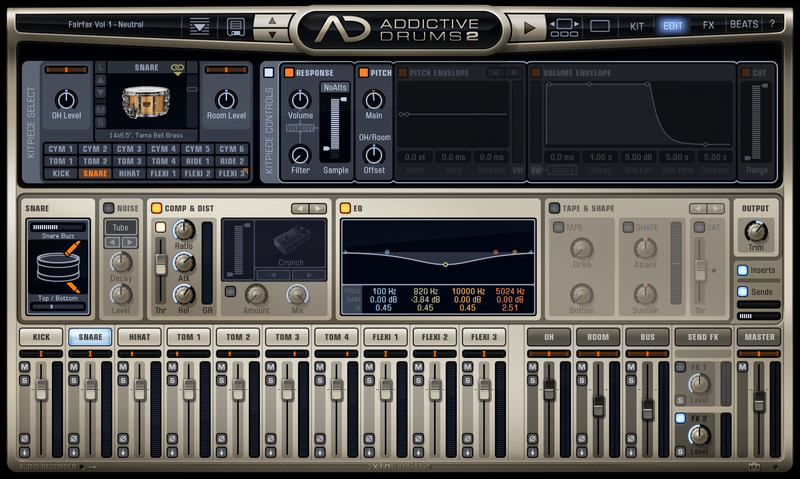 Addictive Drums 2 offers a broad range of sound-shaping tools. Those go far beyond standards such as dynamics tools and effect plug-ins. There are also available algorithms that let one change microphone settings, microphone positions and distances, and routings. Not enough snare wire buzzing “bleeding” into your tom sounds when you hit them? You can increase it. You like the snare drum being mic’d from the top rather than from the bottom? You can do so. You need a different mix between the “clicking” sound of the bass drum pedal hitting the bass drum skin and the boomy front side of the bass drum? You can tweak it as you like. You want to layer a second snare drum sound on top of the existing one? Just use the additional sound slots and link them to the base sound via drag-and-drop. You want to play smooth transitions between the rim and the center of the snare drum by using an expression pedal? The option is there! You want to use a hi-hat pedal controller to control the openness of the hi-hat while you play? The feature is there. It doesn’t matter what kind of sound you want to achieve. 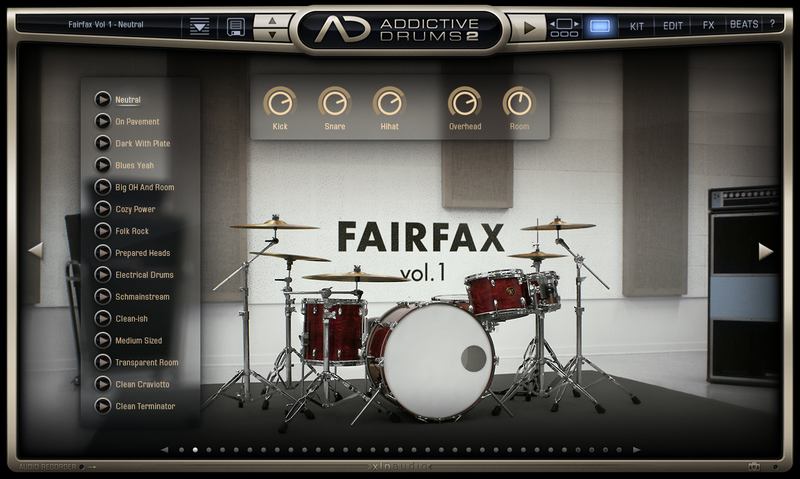 Addictive Drums 2 provides ample sound-shaping freedom to customize your virtual drum kit sound. Each and every virtual drum kit that comes with Addictive Drums 2 and its ADpaks has its own main page which displays that particular drum kit and provides direct access to a lot of presets. When a kit piece is triggered via MIDI, it lights up. This visual feedback not only makes playing finger drumming with Addictive Drums 2 feel more “organic,” it will also help to verify whether or not the sound routing of your setup is functioning correctly. Also, the volume of the kick, snare, hi-hat, overhead and room channels can be adjusted on the main page. A secondary page provides even more presets for the selected virtual drum kit. 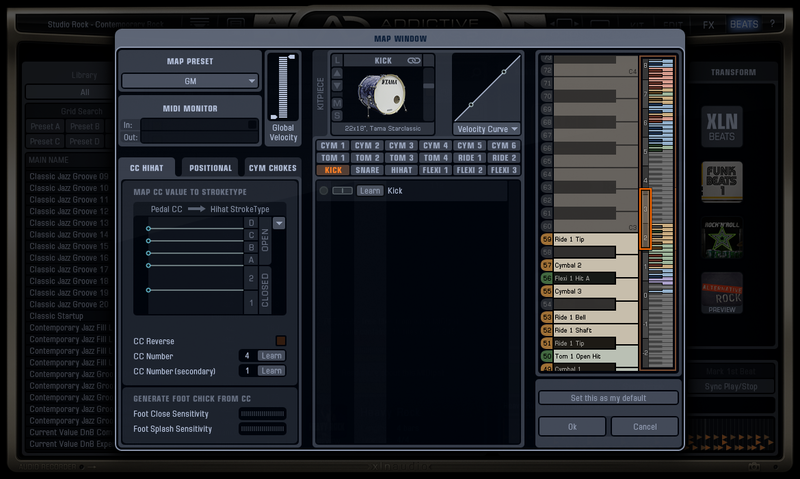 As mentioned, Addictive Drums 2 comes with a lot of presets. Each virtual drum kit of the main application has thirty-plus drum kit presets. The ADpaks have about the same number of presets included. While this is already more in comparison to other available virtual drum modules, additional presets can be downloaded from the XLN Audio website and stored in the “preset cloud”. The preset cloud is helpful as it doesn’t require a person to manually transfer presets between different computers. Once being online and logged-in with your user account, all your presets will be available to you on any computer that you might be working on. The preset management system is also quite handy. Presets can be selected via a simple yet effective tagging method. This helps finding the right preset quicker. Furthermore, it is possible to search for presets using the full text search field. The street price of the Addictive Drums 2 main application is currently US $199. The package includes three virtual drum kits (“Fairfax Vol. 1”, “Fairfax Vol. 2”, and “Black Velvet”). With the release of Addictive Drums 2, XLN Audio have also increased the prices of their ADpaks. Back in the times of the legacy Addictive Drums application, each ADpak cost US $59 in the XLN Audio web shop. The price has been increased to US $89. That’s an increase of US $30 / 50% per virtual drum kit for actually just a visual facelift and a few new added presets. I strongly doubt that new sounds have been added. In my opinion the market of virtual drum modules and related virtual drum kit expansions is already quite saturated. Without having counted them, I believe I own about fifty virtual drum kits from different companies that are well known for selling such applications, like XLN Audio, Toontrack , fxpansion , Native Instruments , Steinberg and a few others. A few years back I didn’t even think about whether or not I’d buy a new ADpak when it was released. I just bought it. Today, with the new pricing having become effective, I think twice and try to find the “added value” of any new ADpak. Addictive Drums 2 can also be bought in bundles. Right now there are two bundles available. Those are the “Creative Collection” and the “Complete Collection”. Only the “smaller” Creative Collection can be bought in regular music stores; the Complete Collection needs to be purchased from the XLN Audio web store. The Creative Collection’s street price right now is US $399. The bundle contains the three virtual drum kits included in Addictive Drums 2 plus “Vintage Dry”, “Session Percussion”, and “Reel Machines”. Three “MIDIpaks” are included as well. Unfortunately, the assortment of ADpaks cannot be changed. The Complete Collection contains every product that the Addictive Drums 2 product line offers: all ADpaks, all MIDIpaks, and all “Kitpiece paks”. In the XLN Audio web shop it costs US $999. Addictive Drums 2 is a fully-fledged virtual drum module that can be used right out of the box, and it can be tweaked to the deepest level of detail, if needed. It comes with high quality virtual drum kits that don’t occupy a lot of space on a hard drive and thus its presets load extremely fast. For me, it doesn’t leave anything to be desired. It has everything I can think of that makes my life as a finger drummer easy and fun. That’s why Addictive Drums has been my go-to virtual drum module since my first steps as a finger drummer. The only downside that I can honestly report is the new pricing that was introduced with the release of Addictive Drums 2. Due to the number of virtual drum kits that I already own, I haven’t been compelled to buy any ADpak since the price increase, although I did buy every single one that had been released in prior years. I will have to wait for the occasions when XLN Audio will put the ADpaks on 50 percent sale again. If you’d like to offer feedback on this Addictive Drums 2 review, use the “comments” section below or the video commenting functions on YouTube or Google+. We’re interested in your thoughts and your experience. If you found this Addictive Drums 2 review and the videos helpful and consider purchasing the product, we’d appreciate it if you’d use the below Amazon link. It does not cost anything additional, but that action helps us keep up the work that we do in order to bring finger drumming to the people. Many thanks in advance!